Donald Trump won Ohio’s 14th Congressional District by 11 points in 2016, which is one reason why the Republican-leaning district should not be “in play” this year. But it is. David Cohen of the Bliss Institute of Applied Politics at the University of Akron says Ohio is gerrymandered in a way that favors Republicans, who control 12 of the 16 congressional districts. Yet, he says the northeast corner of Ohio is not a lock for the GOP. A blue wave that Democrat Betsy Rader is trying to ride against incumbent Republican Dave Joyce. Several political websites including fivethirtyeight.com are predicting Joyce holds a six to nine point lead over political newcomer Rader. It's a much slimmer lead than Joyce enjoyed when he won in 2016 by 25 percentage points. Congressman Joyce is rated in the ideological middle of the Republican party. Since Trump took office, Joyce voted almost 97 percent of the time with the president. Yet he’s running campaign ads highlighting his votes in opposition to the GOP agenda. “When Republican leaders in Congress tried to take away protections for pre-existing conditions I said ‘no.’ I won the fight to fund the Great Lakes Restoration and when President Trump tried to take it away I said ‘no’ again,” Joyce says in his ad. That one healthcare vote last year could be big at a time when Democrats are attacking Republican efforts to destroy the Affordable Care Act. Betsy Rader stands in a living room in Hudson surrounded by about 20 people who came to learn about this Geauga County resident. Rader grew up poor in the Appalachian part of Ohio with a single mother and three siblings. She earned a scholarship to Ohio State, finished tops in her class, and went on to Yale Law School. She gained attention with her op-ed in the Washington Post arguing against the portrait of working-class white Ohioans depicted in JD Vance’s “Hillbilly Elegy”. Although long an advocate for the working poor, Rader became politicized watching Joyce vote 31 times to kill Obamacare. She decided to enter the congressional race when the Trump administration argued that the Civil Rights Act did not apply to sexual orientation. She told the Hudson gathering her two sons are gay. 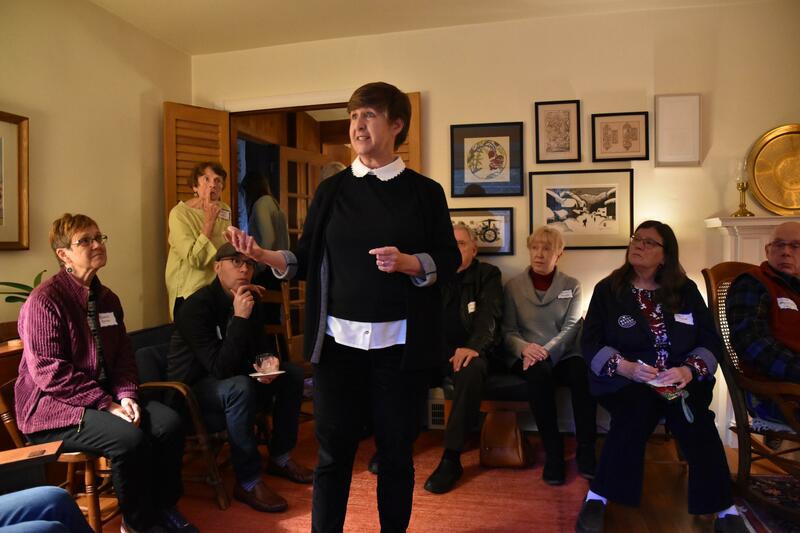 While healthcare is a subject Democrats want to run on, Rader is upset that Joyce is using a false Republican campaign ad this year that Rader and other Democrats want a single-payer government health plan for everyone. Rader, who worked for the Cleveland Clinic and Medicare and Medicaid Services, has a different idea for healthcare. She wants to give Americans an option to buy into Medicare just like any other insurance company. She says the large risk pool and competition would lower prices everywhere. Another big issue for the Democrat is getting money out of politics. Although Rader has raised almost as much money as Joyce, she’s done it without corporate or labor PAC money. While acknowledging that the Supreme Courts’ Citizens United ruling makes it hard to cut off the flow of money, she suggests Congress can make its own rules to eliminate a conflict of interest between member and affected PACs, or, to prevent a member from becoming a corporate lobbyist. The two candidates also disagree on the Republican Tax Cuts and Jobs Act. Last week the Treasury Department announced the federal deficit jumped 17 percent and the tax bill passed last year is getting the blame. Joyce voted for the cuts and says they just need more time to work. At the same time, Republican Senator Mitch McConnell said Medicare, Medicaid and Social Security are driving the debt. Joyce agrees those three programs need to be up for discussion. Rader considers the tax cuts counterproductive. The 14th district borders Lake Erie and Dave Joyce has been an advocate for the Great Lakes Restoration Initiative. All but three members of the House also voted for it. Rader brushed it off as “greenwashing” after the Trump administration worked to roll back water protections in streams and rivers. “What’s happening with that is we are using taxpayers dollars to clean up the mess that corporate polluters have made,” she said. While Trump has called global warming a hoax, Dave Joyce is one of the 90 member Climate Solutions Caucus in the House. He says it will take more than the United States to solve the problem. Although she may benefit from a referendum on Trump in this election, Rader doesn’t bring him up much. When she does, she talks about human rights. Joyce may have publicly crossed Trump in his TV ad, but he says he’s focused on his constituents and not concerned about repercussions back in Washington. “The president says a lot of crazy things I don’t necessarily agree with. That doesn’t make it right and I just want to continue doing the job that I have been doing for all of them,” said Joyce. President Trump is not planning any appearances to bolster Joyce’s campaign. However, David Cohen of the Bliss Institute says the president could still influence the political landscape. Cohen considers the 14th District race too close to call. This story has been updated to clarify Congressman Joyce's position on Medicare, Medicaid, and Social Security.